Should co.za be added to a company logo? Brand Strategy: Should co.za be added to a company logo? We have all seen company names and logos with a ‘.co.za’ or (or another Top Level Domain ‘TLD’ like ‘.com’ or ‘.net’) in their logo. The question is - is this limiting your brand or product and going forward, will this affect a company’s brand perception and growth? Is it a clever way to tell your clientele that you are online and will this drive more traffic to your website? We can’t possibly give a definitive answer to this as it ultimately depends on the finer details of your business, but we can give you a few things to consider that can help you decide what the best route might be. A few years ago when having a company website was still a luxury, it was seen as a good branding idea to add a ‘.co.za’ or a ‘.com’ or ‘.net’ to your logo. This meant people would know immediately that they could visit your website and find out more about what you do and offer online. Nowadays however, it is accepted that most companies have online presences and today you can find details and information on just about any company you are looking for. 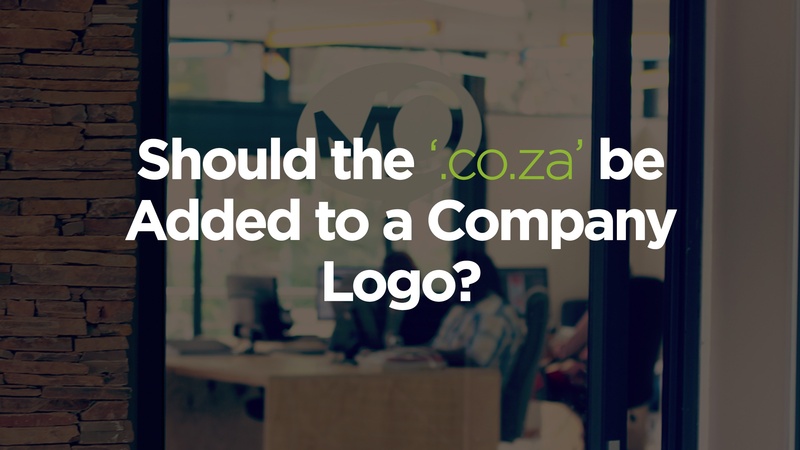 So, is it really still then necessary to add a ‘.co.za’ or ‘.com’ to your logo to let your clients know you are online? We feel that there are scenarios where it is a good idea where the ‘.co.za’ is used in the company’s logo, and it adds a certain aesthetic to the brand. This can be found in sites or companies whose brand name is a common word that benefits from using the “.co.za” in the brand identity, for example ‘cars.com’. For some companies like Amazon the “.com” is essential as it’s an online company operating in many countries and the URL in the logo is a strong identifier to what country portal of Amazon you are using. E.g. ‘amazon.co.uk’ But Amazon is a massive company and in it’s own league; so it’s not really wise to use as a yardstick when considering leaving or dropping your ‘.co.za’. Another question you have to ask yourself before making the decision to brand your company with a web URL, is where do you see the company growing? Leaving off the ‘.co.za’ has the benefit of not limiting the brand identity to the site. There is no reason to brand your company with a web URL if you don’t operate exclusively online. The benefit to removing a web URL from your logo is that it puts focus on what is important – your business and name. Although most people nowadays browse and shop online, there still remain a number of potential clients that are sceptical about buying online. Although these people will visit and browse your website and maybe even leave an enquiry - purchasing goods over the internet still remains a perceived risk for them. Depending on the type of business you run, this can mean you are losing out on these potential clients. If the company is only an online eCommerce site with no brick and mortar locations, then there is a very valid argument to retain the web URL in your branding. This however means that your eCommerce website need to tick all the boxes for a successful eCommerce website. There is nothing worse than visiting a company’s website that has the ‘.co.za’ in the logo and the website is terrible. If you are going to brand your company as an eCommerce player – make sure you are good at it. A good example of a company that recently added their web URL to their logo is Yuppie Chef. When looking at their website they tick all the right boxes for good website design as well as a well executed rebranding exercise. Use these guidelines for designing and naming your company brand/logo; also keep in mind your SEO, this will be covered in our next article.